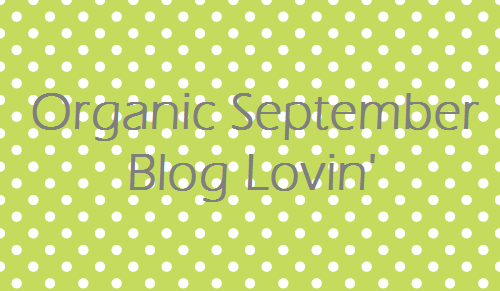 Organic September Day 27: Blog Lovin'! I was running out of ideas for Organic September and then I thought I'd share with my readers some great posts that other bloggers have written for Organic September! I am sorry if I miss anyone out...there was a lot! Rachel from All Natural Aspirations blogged about one of her favourite mascaras - Green People Mascara/Eyeliner and the Pink's Boutique Lemongrass Body Try Me Set! Ana Goes Green blogged throughout Organic Beauty Week as she does every year! She blogged about Herbfarmacy, Botanicals Collection, Green People Mascara, Pink's Boutique Manicure Try Me Set and her fab Organic Beauty News #10 posts which always make me add more to my wishlist! Tania from Bowtied Beauty blogged all about the Pink's Boutique Lemongrass Body Try Me Set with gorgeous photos! Sarah from Sugarpuffish posted an Introduction to Skin & Tonic, a new brand that is on my wishlist! The girls at Call it Vanity posted an Organic Beauty Week offers post as well as an Introduction to Skin & Tonic as they're now exclusively at Content. Chesca from Fern & Moss blogged about some lovely Soil Association certified products from Pink's Boutique Lemongrass Facial Box, Green People Soft Buff Exfoliator review and Spiezia Rose & Vanilla Facial Oil review. Tamara from Rainbow Feet blogged about the fabulous Pink's Boutique Manicure Try Me Box and she wrote a review of some Green People Body Products! She also blogged about the Organic Beauty Week Event that we went to together! The lovely Alex from The Greener Beauty Blog included my blog post in her Organic Beauty Week Favourites post! Annabel from Fragmented Splendour blogged about Organic Beauty Week & some Soil Association verified products and she also writes over at Nouvelle Daily & wrote a post on Shopping Online for Organic! Sandra from Beauty Balm treated herself to an Odylique Gift Set using the discount code she got in the Love Lula SA Organic Beauty Box! Sandra also blogged about the newly released Nourish Kale Exfoliating Cleanser! Content Beauty & Wellbeing have put together some fab posts for Organic September including their "Content Shopping List for Soil Association Certified Organic Food & Snacks" and their Beauty Version too. The lovely Charlie who runs Sophia's Choice blogged about some organic products - Therapi Honey Skincare Toners, Pink's Boutique Lemongrass Facial Try Me Set, and she started off the month by blogging about Supporting Organic! This is sucha great Idea to concentrate on organic for one month! I may have to join in next year. In the meantime here is my blog.